An architect discovers his front window is a gallery to share with artists and locals. This is his story on how he learnt to share opportunities with others. Patrick Miller has worked his way through north, central and south America, Europe and Asia. 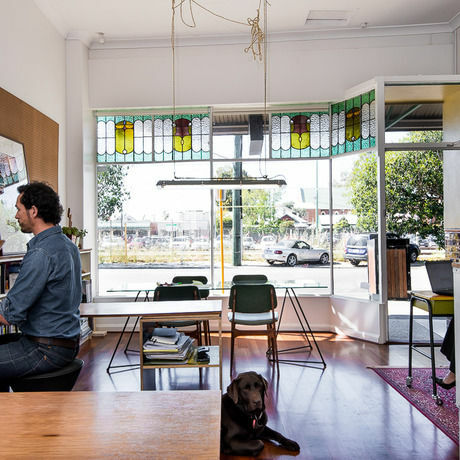 He now works out of a small studio in Maylands whose bay windows act as a gallery for local artists. Beyond the window the trains fiz past every 15 minutes. He may be tempted to hitchhike around Hawaii again but for the smartest dog in the world (Einstein) settled at his feet, two children around the corner and the drumkit beside him. He’s an architect and more. Some of it by chance.